This guest blog post comes from Nicole Ratner, CAE, CMP. Like a personal relationship, networking groups should be an easy conversation between people and leave you wanting to get together again to learn more. I adore this topic: networking not dating! I got that out of my system long ago. Back in 2012, I wrote an article for the American Society of Association Executives on ‘How CAE Study Groups are Like Dating‘ and after reading it again this weekend realized the same information is accurate for networking groups. Sweaty palms, nervous excitement, heart racing just a little. I wonder what it will be like. Will we hit it off? Are we going to get together again? Do any of these sound familiar? For me, this is how I felt before my first date with my now husband. However, three years ago I had the same feelings before going on my first “date” with a local networking group. Typically, when dating we tend to look for similarities in our partners. Knowing that you have commonalities tends to make the conversation flow a bit easier. The same is true for choosing your best fit for a networking group. You’ve already made the step in which group you want to join or visit, and so you and the other group members have that in common, not to mention the background in being a business owner. We choose partners that we connect with and ones that we learn from. So, who makes the first move to initiate the “date”? For me, our group formed by one woman deciding that our area needed a networking group and this was before the big boom of all the other groups. I met her at a local event and she invited me to attend. Knowing that I was moving to the area I felt it would be a good way to meet others and showcase my business to a new crowd. So, I like to think that I was asked on that first date! But it’s easy to make that first move even if you aren’t already involved in a local group. You can search networking groups via Facebook, use the Meet Up app, ask your friends who are small business owners if they belong and tag along, find a local BNI or contact your local chamber of commerce. Remember, these days you don’t have to belong to one that meets in person, there are many virtual groups as well, just make sure the group you join meets your needs. Prior to my first date (at a local restaurant on a weeknight) I made sure I had my business cards ready, my ’30 second pitch’ as to who I am and what I do and made sure there was nothing stuck between my teeth! Each month there was a new topic and I happened to be coming in on the one about preparing for tax season. Sounds boring; dates should be fun, right? For us we made sure to keep it simple and fun. Each one of the members contributed to the discussion, and this was a wonderful way to learn from others. The first date should be easy conversation between the people, not dominated by just one person, and it leave you wanting to get together again. Isn’t this an awkward part when going on that first date? Who pays? There are so many options these days for networking groups. Some are held on the same day of each month and are done during a meal period in which each person is responsible for their own meals. Some don’t include any so no money is necessary. If you are initiating the first ‘network’ get together it might be nice to pick up the check! Then there are the membership organizations and this is our bread and butter. My business partner has over 25 years experience as a membership expert so we are always looking into the value proposition offered. We are hired to come in and audit companies (of all sizes and budgets up to millions) to help grow and retain their memberships. A membership based group is one in which you pay dues and in exchange receive member benefits. Think of your membership to Costco, Amazon and Gyms as similar. For me the value proposition has to be there. If I am paying dues I know that I need to receive certain benefits to truly make that money I’m spending worth it. So, on this front make your list of pros and cons to see if it’s a good fit and what you’ll really be spending based on the benefits. Put it this way it won’t just be a membership fee you pay there are always extras or the fine print as we like to say. All good relationships take work to keep them going strong, and you could tell this group was committed. We were mindful of each other’s jobs and personal commitments. We still have ‘dates’ monthly and continue the learning both personally and professionally. We’ve grown in size and education. Dating should be fun; it’s a time to figure out what you like and dislike and what you are looking for in a lifelong partner. 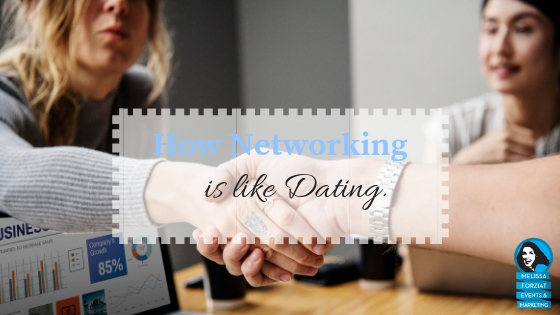 Finding the perfect networking fit is very similar. Just remember you’re not alone in the journey and you’ll do great. Is it ok to break up with your networking group if you’re not happy? YES! Here’s the thing: networking groups mean netWORKing. You have to work at it to make it worthwhile. If you just expect to go in and get business that’s a one-sided relationship. So, if you are a part of a group that doesn’t seem to be a good fit, take a time out and look around at what else is available. If you put the work into the relationship odds are that you’ll reap the benefits. We want to hear about your first dates. Tell us your best first date experience with a networking group or maybe it wasn’t such a great experience. To view the original article via ASAE please CLICK HERE. With over 19 years of experience in association management with expertise in meeting and event planning, educational programming, board and committee relations, communications, and more, Nicole is a former Executive Director of a national association where she handled the day-to-day operations, membership, marketing, meetings, and education. She and her husband, Dan Ratner, currently own The Next Steps, LLC where they focus on education and consulting membership organizations. She is a graduate of George Mason University with a BA in communications and previously worked for NBC4 in Washington in the Entertainment division. She received her Certified Meeting Planner (CMP) Designate in 2007 and Certified Association Executive (CAE) Designate in 2009. In addition, Nicole has over 11 years experience in network marketing and direct sales leading a team of over 20 at one point. In her experiences she worked with her team and corporate for training on events, sales, networking, marketing, goal setting, strategic planning and leadership. In her spare time she enjoys dancing and is a former trained dancer in competitive ballroom. She also loves to travel and has recently launched https://cruisingwiththefamily.com a blog dedicated to helping those who are new to cruising learn the ins and outs of cruising with the family. Her greatest accomplishments are that of her marriage to husband and business partner, Dan, two precious daughters and cat, Lucky.